Travertine is a unique and versatile stone, suitable to a wide range of decorative styles, from rugged and rustic to welcoming old world charm to stunning high-polished elegance. However, your travertine can become dirty or dull-looking, scratched, etched, cracked, chipped, or otherwise damaged with time and use. If this is true of your travertine, don’t replace it! Natural Stone Care can restore your travertine, not just making it look better, but making it look brand new again. To fill or not to fill, that is the question. Travertine in its original state has naturally occurring holes throughout. Part of travertine’s unique appeal is that it is available in two distinct forms — filled and unfilled. In “filled” travertine, a color-matched material, usually epoxy, is used to fill the holes, giving the stone a smooth finish. In “unfilled” travertine the natural holes remain exposed for a rustic, earthy finish. Both filled and unfilled travertine are beautiful in their own right, and both offer their own particular challenges. Refinishing is similar to floating, in that you can restore a finish that is uneven or has become dulled by wear, scratches or other surface damage, or alter the finish entirely if you’re looking for a change of pace. Natural Stone Care is well versed in the types of finishes possible, as well as experienced in the techniques required to achieve them. Whether you want a floor that is flush with its grout lines for easier cleaning, or need to remedy uneven tiles that can be hazardous as well as unattractive, Natural Stone Care can take care of that for you. Using state-of-the art diamond grinding technology, we can remove excess stone to create a flat, level surface . Once the uneven tiles are leveled (this is called lippage removal), the travertine is honed and polished to your desired finish. Natural Stone Care can hone your travertine surfaces to eliminate surface imperfections such as dull spots, scratches, etching and other wear and tear, resulting in a damage free surface that looks like new again. With the damage erased, our expert technicians can polish your travertine using the appropriate diamonds or polishing powders, achieving a honed (soft matte) finish that is warm, inviting, and velvety smooth, a gorgeous glass-like polish, or something in between that suits your taste. While any travertine surface can become dirty and grimy with use, unfilled travertine with its naturally varying surface texture and inherent holes can be particularly challenging once dirt has had time to accumulate in the hollows and low points. Not to worry, though, Natural Stone Care can remove deeply imbedded soiling, strip away years of buildup of unsightly topical treatments, remove soap film in showers, get rid of soot on fireplaces, and resolve a host of other travertine cleaning problems, leaving your stone as pristine as the day it was installed. Sometimes, in spite of your best efforts, stains happen. That’s the time to call Natural Stone Care. Whether you’re looking for DIY advice or want to hand the mess off to us, we’re happy to tell you that most stains and discolorations can be resolved. Before you replace your chipped, cracked or otherwise damaged travertine, talk to us about our expert travertine repair services. Natural Stone Care can fill holes in travertine, and fix travertine cracks and chips, blending the repair site with the surrounding area, then honing and polishing it to match the overall finish of the rest of your travertine floor, countertop or other travertine surface. It’s rare to find travertine that is damaged so severely it cannot be repaired, but every so often we encounter a tile that just has to be replaced. Don’t worry, we can handle it. Natural Stone Care can replace your tile, using extra care to avoid damaging neighboring tiles, then level the replacement tile with its neighbors, and match the surrounding finish as closely as possible. Do be aware though — unless you have extra tiles on hand from the original batch, replacement tiles may be noticeably different. Because travertine is a natural stone, even tiles from the same quarry and with the same designation can vary in color and appearance as time passes and the quarry line shifts. 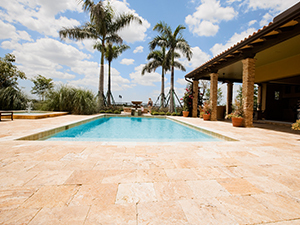 For travertine surfaces with high traffic and use, routinely scheduled maintenance services are highly recommended to keep your travertine looking its best. Natural Stone Care is happy to provide these services for you. Natural Stone Care provides expert interior and exterior travertine services, for all kinds of properties, from homes, apartments, and condos to offices and other commercial properties, warehouses, retail stores, restaurants, hotels, and more. Whether you need minor services like having your travertine cleaned and sealed or major services like extensive repair and restoration, we provide a full range of travertine care and maintenance services. For a free estimate on travertine floor polishing, travertine shower cleaning and sealing, or other travertine restoration, repair, and refinishing services throughout our service areas (Orange County, San Diego, Riverside and San Francisco Bay), contact us online or call (866) 985-0211 today.